Type 2 Diabetes is indeed fully reversible and it is certainly a curable condition. In early 2016 I was diagnosed with an acute case of Type 2 Diabetes. My Hemoglobin A1c level was at 11.0, an extremely high level (normal is 4–5.8). The physician looking over my test results said I have contracted a condition that has no cure. And spent a couple of minutes explaining the basics of the recommended diet which is about cutting out carbs and eliminating sugars. He also put me on a very typical drug called Metformin that later I learned though my own research that it was the wrong move by him. The very first time I took that drug I realized it’s not for me. I hated how it made me feel. So, I cut up the pills into 1/4s and took just one 1/4 of a tablet a day with my meal for a little while. Then I noticed that even that small an amount was making me gain weight. Weight gain is the last thing you want when you are trying to reverse Type 2. I didn’t bother with prescription drugs after that point. I went to another physician who just like a recorded message repeated the same phrase heard by tens of millions of Type 2 sufferers, that I have contracted a condition that has no cure. He was also going to suggest Metformin which I rejected; so he wrote a prescription for another drug that I never filled. The key point the second physician didn’t bother to notice was that just by changing my diet and being even more active and taking basically no prescription drugs I was able to lower my A1c by a substantial level. Right then I understood that there is something very very wrong with how Diabetes is being handled in the US, perhaps through out the world. It’s being used as a market for putting people on a lifetime of needless prescription purchases. So I started an intense research and self-education about how to beat this. The first rule of war is to know your enemy. For me proper research means digging well beneath the mainstream and reading variety of thoughts and solutions before forming an idea. 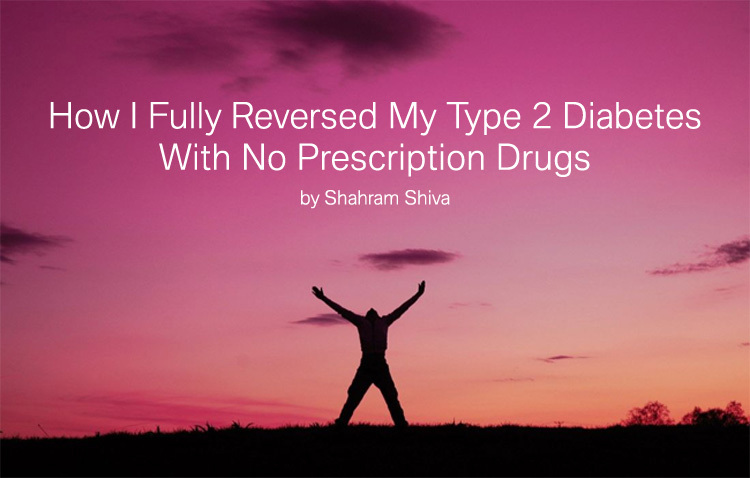 One of the ideas that popped up early on was surprising to me (due to my own programming by the mainstream healthcare) that Type 2 Diabetes is indeed fully reversible and it is certainly a curable condition. The other point that hit home with me was that typically new patients should never be put on drugs and must be given a chance to improve their health first. Radical thoughts but they are totally spot on as my case proves it. I had one thing going for me, I was fit but I was relying too much on carbs. And after a couple of years of combating Type 2 and now beating it, I am even more fit. My A1c is at a mid normal level of 4.9. In fact I am in the best shape I’ve been since my 20s when I was an intense yogi. One of my short poems of Rumi (quatrains) that consistently receives huge laughs and roaring applauds from the audience is The Doctor Joke. I never really understood why the audience in my events would react so excitedly to this poem, since I’ve always been healthy and have had little interaction with the mainstream medical system until I went through this experience. How Did I Beat Diabetes? 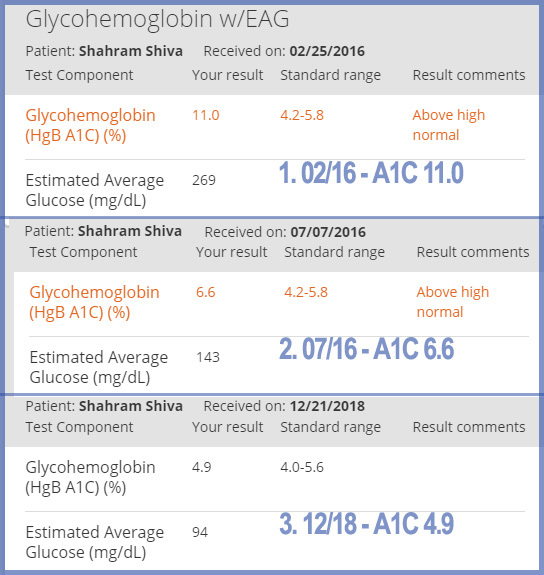 Image shows 3 separate A1c blood tests. By the 3rd test my levels were totally normal. My research was extensive and for me the results were concrete that this condition is 100% treatable. So I fully believed in the outcome. By just trying to be healthy I was already on very low processed sugars anyway, but I cut out all sugars whatsoever. I eliminated all baked goods, including all breads. I lowered my carb intake to the absolute minimum and also eliminated all “white carbs” such as white rice and white pasta. Wasn’t a fan of sodas to begin with but totally eliminated all beverages with sugar and all juices. Juices are sugar concentrate specially fruit juices. I snack only on minimal amount of fresh fruits, such as blueberries, also apples with their skin intact, simple veggies like raw carrots and nuts. I started a daily exercise, cardio, light weight training and stretching routine. Initially began at around 10 mins, now it’s up to 45 mins every single morning. Arianna Huffington is going to like this part, since she has been promoting the healing properties of sleep for a long time. I made sure to get enough sleep every night. I have been taking 1 tablet of Chromium Picolinate natural supplement daily that is supposed to help with sugar metabolism. I am not sure how helpful this particular step has been yet, as I will eventually do a 3-month trial of no natural supplement. I hope this article inspires all of you to take a more personal and direct interest in your health and continue to educate yourself about ways to maintain your well-being through natural means, diet adjustment, some daily movement such as walking and portion control. I intend to write a more detailed report later.